Is this the best we can do? Foggy, low-res, windowboxed, interlaced versions of Chaplin’s classic shorts? Oh wait, no I see i can get nicer copies from BFI for $70. Bah. One A.M. (Chaplin Mutual #4) has been a favorite since I first saw it a couple years ago. Weird Thing #1: This is a Chaplin one-man show, a solo slapstick performance interacting with props and sets (actually one other actor, a cab driver, but he barely moves). 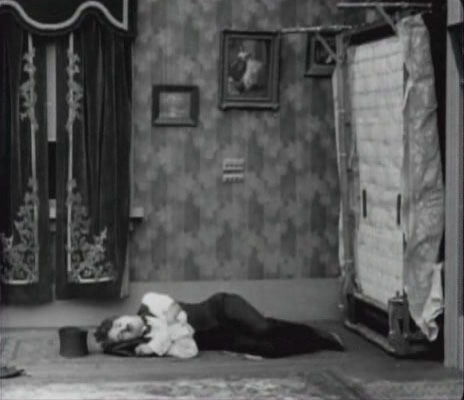 Weird Thing #2: Chaplin is rich in this, apparently a big-game hunter with his own two-story house. Our man comes home very, very drunk and tries to negotiate the cab door, his bunches of stuffed animals, treacherous furniture and slippery floors, two staircases, a clock with a murderous pendulum, and a self-aware hideaway bed. Hilarity ensues. 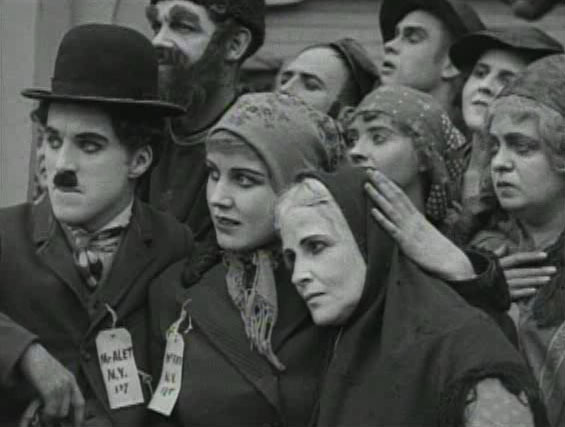 The Immigrant (Chaplin Mutual #11) returns us to the guy we know – poor, but sweet and resourceful. In the first reel, he’s on the boat coming to the U.S., thwarting a card cheat and helping out Edna Purviance (seen next to C.C. below). The second reel is essentially a whole new movie – Charlie finds some money so takes himself out to eat – sees Edna and treats her too. But the money has disappeared, and now C.C.’s got to figure a way out of the place lest he be beaten to death by head waiter Eric Campbell. Fortunately more money shows up rolling around on the floor (streets paved with gold, and all that), but another guy grabs it, and through some trickery, Charlie pays with that guy’s tip. He celebrates this victory by practically forcing Edna to marry him.